Thursday late night, 18 May 2017, the Greek Parliament voted to accept another round of devastating troika (EC, IMF, ECB) conditions for an additional debt package of close to 5 billion euros. All of the 153 delegates of Alexis Tsipras’ Syriza-Anel coalition voted ‘en bloc’ for the suicide package, all 128 opposition members against. Nineteen didn’t show up. Perhaps they were too afraid to vote for the opposition. Just as a reminder, PM Tsipras, a socialist, is leading Syriza, Greece’s prominent left-wing party, that for reasons of majority decided to align with the extreme right-wing party ‘Anel’ which currently holds a mere 10 seats in Parliament. And another reminder- Alexis Tsipras, for the last two and a half years, since 26 January 2015, to be precise, has been selling his soul (if he has one), and more importantly, the country that trusted him, to the western crime oligarchs, i.e. the IMF, the European Commission, akin to the European (non-) Union and the Goldman Sachs-run European Central Bank – and Germany. James Petras calls him the Traitor of the year. This may be an understatement. This new hateful and odious debt – Tsipras and his clan know that its fraud – this new debt will pave the way for more ‘rescue’ packages (a neoliberal term for legal robbery) that will help servicing (pay back) the odious debt – meaning the illegally acquired and imposed debt. Odious Debt, according to all international standards and laws, is illegal debt and may be defaulted on, or canceled at any time by the debtor nation. This new debt is supposed to alleviate the already monumental and monstrous burden of debt, close to 200% of GDP. Repayment ever is impossible, even by the words of the IMF. Not a penny of the new loan benefit the poor and the destitute, those that have lost everything – those 30-plus percent that are already under the poverty line, of which 1.5 million live in extreme poverty, about 13% of the 11 million Greek population. They stagnate along, many as beggars as a last resort, without jobs, no income, no pensions – all gone, by the troikas criminal imposition of debt and austerity. The new 5 billion-euro debt comes with even more austerity strings attached, more cuts in pensions, salary reductions, of the remaining meagre social services, privatization of what’s left of social capital and infrastructure – in total cuts of about 4.9 billion euros until 2020. These cuts will further increase poverty, misery, famine, child mortality diseases without cure, no medications, no hospitals, desperation, the suicide rate – and the economy that collapsed by 25% since 2011, will further shrink – beyond the point of no return. How can anybody in his clear mind think or pretend that this will help Greece out of its strangulation? – It is sheer Suicide that you, Mr. Tsipras and your spineless fellow Members of Parliament are driving your country to commit; slow and hurtful hara-kiri. Not you, of course, Mr. Tsipras. You will be rubbing elbows with the elite that destroys your country. Have you given your people a rational justification, why they should continue to suffer? Why are you still reluctant, even unwilling to talk about exiting this horrendously corrupt construct, called the European Union with is fraudulent, dollar-based and totally unsustainable currency, the euro? You can take that decision any time. You could have prepared for it – so transition would be smooth. And if you haven’t, it’s never too late. Just give your people hope they can count on. You could gain back your country’s pride and sovereignty – a country and a people that is the symbol of western civilization in more ways than one. Why do you think you are so important, that your staunch egocentricity is ranked higher than the well-being and the recovery of the people who love their country and who have elected you, believing in you? 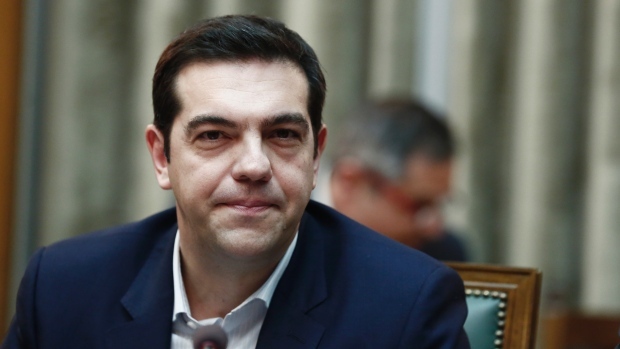 – Why do you betray your people, Mr. Tsipras? Where is your love for your country, for your countrymen who have given you a mandate to lead them out of their predicament? Just think for a moment what love could do for them and for your own Peace of Mind. Are these dark forces behind the money cartels threatening you? Your family? – If you don’t obey, you may be ‘wasted’, in the jargon of western secret services. It has happened before and keeps happening. As a Statesman, step up and tell the world, while saving Greece. Step out from this straight-jacket of debt and misery, default on your illegal debt, bring back your own currency, the drachma, and start afresh as a new sovereign country. More than half the world is in solidarity with you. Even in the west. 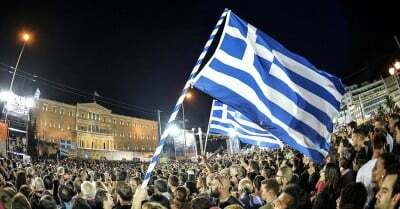 Many countries would like to support you, Greece. The diabolical western Brotherhood’s fist in their neck prevents them from doing so. In the East, there is no fear. They will stand by you. The East is the future. Be aware: The East Is The Future. President, Mr. Xi Jinping’s massive “Economy for Peace” ingenuity, the OBOR – One Belt One Road, now also called the Belt and Road Initiative – BRI, is China’s response to the western world’s economic collapse from greed and aggression. It’s the largest economic platform in the world, encompassing already now more than a dozen countries, more than half of the globe’s population and at least one third of the world’s GDP. The BRI promotes economic development, transportation, infrastructure, energy, education and research – in dimensions unseen in the past. The idea is to connect all nations and people from Vladivostok to Lisbon and from Shanghai to Hamburg. All are invited, not forced to join. Greece – open your minds, eyes and hearts to OBOR / BRI and you will see a bright future, a quick recovery from your current state of demise. Be courageous. Enough is enough!